The Basin extends from high altitude (1,200 m) forested mountains in the Great Dividing Range to the Murray River at Lake Mulwala. Almost two thirds of the Basin (south of Wangaratta) has steep mountains and hills and most of this is covered with forests. The main rivers (Ovens, Buffalo, Buckland and King) flow in wide valleys of cleared farmland. Mean annual rainfall exceeds 1,400 mm in the mountains in the Great Dividing Range but decreases to 500-600 mm nearer the Murray River. Water quality is generally good throughout the Basin with fresh water (< 300 EC), low levels of nutrients, turbidity, colour and bacteria levels in most rivers, except in the lower reaches of the Ovens River. The high rainfall and granitic rocks in the mountains result in clear, fast- flowing, clear- water-rivers, with coarse substrates in their upper and middle reaches. These support good self-sustaining populations of blackfish and brown trout. Access to almost all rivers is excellent for conventional vehicles with good fishing possible without extensive walking. All the best fishing is in rivers with the exception of Lake Mulwala (often called Yarrawonga Weir), which provides excellent fishing for Murray cod and golden perch. There are two reservoirs, Lake Buffalo on the Buffalo River and Lake William Hovell on the King River. All rivers in this Basin have had at least a decade of below average flows resulting from drought conditions. In addition, the King, Buffalo, Rose and Dandongadale river catchments were burnt out by bushfires in 2006/07. The extended drought and bushfires have affected instream habitat, resulting in loss of some biota. However experience has shown that river structure and instream habitat recover quickly, once flow regimes return to normal. Buffalo and Mulwala lakes and William Hovell Reservoir were at full capacity early 2009. (Large fish): Golden perch, Murray cod, Murray spiny crayfish, freshwater catfish, Macquarie perch and trout cod. (Small fish): Australian smelt, blackfish (two species), mountain galaxias, Murray hardyhead, Murray River rainbowfish, southern pygmy perch, and western carp gudgeon. Brown trout, European carp, eastern gambusia, rainbow trout, redfin and tench. - manages stocking, fisheries policy, compliance with fisheries regulations and angler contact. A FMP has been declared for waters within this Basin. Fisheries Victoria Management Report Series. North East Fishery Management Plan. No 48. August 2007. Stocking Program (stocking plans for desirable species are based on an approved stocking The Victorian Fisheries Authority policy and are reviewed annually via Vic Fish Stock). Buffalo Lake, Anderson Lake, Ovens River, King Lake, Kerford Lake, and Sambell Lake are stocked with native fish. Harrietville Dredge Hole and Eldorado Dredge Hole are being considered for a stocking of native fish. Salmonids are only stocked into Andersons Lake, Fosters Lake and Sambell Lake. Family Fishing Lakes Program (an ongoing project of stocking small waters within urban areas with larger trout, for junior and disabled anglers. See Introduction for further information). There are three Family Fishing Lakes in this Basin. Fosters Dam is being stocked with rainbow trout. Anderson Lake and Sambell Lake receive both native fish and rainbow trout. See details in angling waters. Ovens River and tributaries upstream of Eurobin. Ovens River tributaries downstream of Myrtleford (junction of Buffalo River) upstream of Woolshed Falls, Fifteen Mile and Boggy creeks upstream of Whitfield Road Benalla. Buffalo River upstream of junction with Camp Creek. King River above Lake William Hovell. William Hovell, Buffalo, Sambell and Kerford lakes. King River below Lake William Hovell to Edi. Ovens River from Eurobin to Myrtleford (junction of Buffalo River). Buffalo River from Lake Buffalo to Camp Creek Junction. Buffalo River below Lake Buffalo. Ovens River and tributaries below Myrtleford. Hurdles, Horshoe, Didda Didda, Reedy, Black Dog creeks. Bush Fire Recovery Program. (In 2007, a three-year project commenced to support the recovery of the recreational fisheries in fire damaged areas.) Research completed revealed that severe drought conditions and post-fire flooding also contributed to the degradation of fish habitats and that all accept one river in this Basin still had trout (See Introduction for more details). Major waters affected in this Basin by the bushfires are the upper King, Rose and Buffalo rivers, including their tributaries. - the Freshwater Ecology Group carries out fisheries research. National Trout Cod Recovery Program (a national project to restore trout cod populations in waters within their natural range). Currently a stocking program by DSE into the Ovens River is showing very promising results. 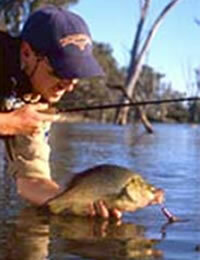 - is responsible for catchment management and the Victorian River Health Program. Victorian River Health Program (an on-going state government initiative to achieve healhty rivers, streams and floodplains). Removal of willows, revegetation of banks, improved water flow and other improvement works is occurring along the Ovens River, King River, Fifteen Mile Creek and Happy Valley Creek. - manages irrigation, domestic and stock, and some bulk water supply services, also development of Stream Flow Management Plans. Stream Flow Management Plans (an ongoing project in which various agencies and water user's develop a flow sharing arrangement which ensures an adequate environmental flow allocation for each river in Victoria). A draft SFMP is been prepared for the Upper Ovens River. - manages urban water demand. The Ovens River from Killawarra to Lake Mulwala. Yarrarabula Creek and Long Jack Creek (two upper Buffalo River tributaries) and Devils Creek-Middle Branch (a tributary of the Buckland River). Six fish in this Basin (trout cod, Macquarie perch, Murray hardyhead, Murray cod, Murray River rainbowfish, Murray spiny crayfish) are threatened species in Victoria. The list of Victorian threatened species, with their national conservation value, scientific names and explanation of their conservation status category, is available on the DSE web site (Department of Sustainability and Environment [DSE] Dec 2007). Species in bold type and the Lowland Riverine Fish Community of the Southern Murray-Darling Basin are also listed under the Flora and Fauna Guarantee Act 1988. ) and cannot be taken or kept without an order, licence or permit. Such an order by the Governor in Council allows anglers to take Murray cod and Murray spiny crayfish.